The government of Anguilla could soon become the first country to formally harness the red-hot growth of initial coin offerings (ICOs) through legislation aimed to create regulatory clarity for the industry and attract new investment to the island jurisdiction. The Caribbean nation’s House of Assembly is expected to vote on the “Anguilla Utility Token Offering,” or AUTO Act, on Dec. 21, after which companies will be able to register their ICOs with the government. Anguilla is hoping the fervor for token offerings could create a booming new revenue source, while assuring startups their project won’t fall subject to securities regulations. The main hitch: Just because Anguilla might certify that a company’s “utility tokens” don’t qualify as securities doesn’t mean other countries will respect that designation. Governments around the world are grappling with how to respond to the rapidly growing but still loosely-regulated cryptocurrency industry. ICOs provide a means for startups to raise funds, typically in Bitcoin or another digital currency, to support projects in exchange for digital “tokens” that can be traded or redeemed in various ways. At least 16 countries as well as the jurisdictions of Hong Kong, Abu Dhabi, Dubai, and the European Union have issued regulatory guidance since July surrounding ICOs or the exchanges they trade on, according to Bloomberg Law’s Global Token Sales & ICO Regulatory Tracker. Now countries and territories like Anguilla, Bermuda, and Gibraltar may attract the latest companies creating these technologies with new regulatory frameworks for cryptocurrency markets. These efforts could advance the international debate on regulatory standards but still may not offer a safe harbor for companies selling to U.S. investors, financial attorneys and think tanks told Bloomberg Law. ICOs function similarly to crowdfunding as a way for startups, companies, or people to raise capital quickly by selling investors or buyers virtual coins, otherwise called tokens, cryptocurrencies, or digital assets. However, some regulators have cautioned ICOs may bear more similarity to initial public offerings, with all the reporting requirements and registrations such activity entails. It’s easy to see the attraction for Anguilla, a 35-square mile, eel-shaped island to the east of Puerto Rico, to establish itself as a destination for crypto-regulation. The ICO model has soared in 2017, with companies and projects raising over $4.2 billion since the beginning of the year, according to Autonomous Research, a global financial data research firm. 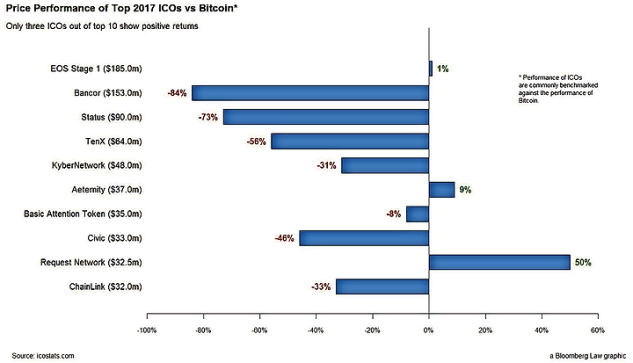 However, neither of the two largest ICOs this year, Tezos and Filecoin, have issued their tokens, and only three of the top 10 ICOs in 2017 with a token issuance have seen positive returns relative to the valuation of bitcoin, as of Dec. 13. With passage of the law, new revenues could flow into state coffers from ICO registration fees and a 1.5 percent levy on the total amount raised by a token offering. “The hopes are that these funds will be used to go toward training and also the development of the blockchain register,” Lonnie Hobson, Anguilla’s Deputy Registrar of Commercial Activity whose office would oversee the registrations, told Bloomberg Law. In exchange, Anguilla is promising registrants streamlined review and approval and the government-backed approval that what’s on offer won’t fall into the bucket of securities regulations. “It will give issuers some kind of certainty on how to conduct their initial coin offering,” Hobson said. The AUTO Act was co-authored by an Anguilla-based tax and finance attorney, Ravi A. Bahadursingh of Chancery Lane Chambers, and Randall W. Johnson, senior counsel with Atlanta-based Sinnott & Co., specializing in securities and blockchain, Hobson told Bloomberg Law. Neither attorney responded to a request for an interview. The legislation puts Anguilla at the vanguard of nations figuring out how to treat what many in the financial services industry view as little more than a Ponzi scheme. Despite the fervor many ICOs have attracted from their supporters, a growing list of international authorities—including China, South Korea, the U.S., and U.K.—have either shut down ICOs altogether or alerted token investors and traders of risky coin offerings running rampant and fined fraudulent operators. This has created uncertainty about the status of individual ICOs even in jurisdictions where authorities have permitted them, but the funding vehicles continue to attract support. The AUTO Act is structured to try to avoid securities regulations, Hobson said. Utility token classification avoids the “higher levels of regulatory scrutiny that would have to take place” were the tokens to fall under securities laws, Hobson said. An ICO, for example, couldn’t promise token holders any share in the profits or controlling interest in the underlying technology or activity related to the offering, he said. Tokens under the utility classification could be redeemed for a consumer good or service, such as access to web storage or a video game. Anguilla is taking its own steps to try to reassure potential registrants and investors. The ICO registration process will include ownership disclosures similar to those from capital offerings, Hobson said. The bill also includes provisions to rescind token sales and take enforcement action against any fraudsters. Anguilla may well become a test case for how one country’s embrace of ICOs butts up against the laws of countries taking a more skeptical view of ICOs. One of the biggest challenges for Anguilla’s efforts will be the extent to which the Anguillan regulations comports with the laws of other countries, Carol Van Cleef, a partner at Baker & Hostetler LLP who regularly advises companies on ICOs and cryptocurrencies, told Bloomberg Law. “What we may view as a security in the United States may be different from what we have on their checklist as a security,” Van Cleef said. Thus, regardless of how Anguilla may view an ICO, Anguilla’s classification and regulation of an ICO as utility token will not necessarily mean an ICO offered to a U.S. resident will not be a security under U.S. law, she said. Countries making an effort to create a regulatory environment for ICOs may also get to help set token classification standards for the industry as more countries look to follow suit. But reconciling differing definitions could still be a challenge in the future. “The challenge of the utility token is that the utility is in the eye of the beholder,” Brian Knight, a senior research fellow for financial markets with the Mercatus Center at George Mason University, told Bloomberg Law. While the AUTO Act may provide some regulatory certainty for both ICO launchers and investors alike, the question becomes: “how far does that law go,” Knight said. It’s unlikely U.S. or U.K. regulators would accept an ICO company’s claims that it’s exempt from registration or other securities laws in those jurisdictions simply because Anguillan authorities had deemed them to be a utility token, Knight said. “The United States government is unlikely to accept that as an answer,” he added. Nevertheless, Anguilla’s move to register ICOs takes a forward step in the global dialog on the classification of digital tokens, she said. “I think it’s definitely going to help the general conversation on where the lines can and should be drawn with these different types of tokens,” Van Cleef said. “Every development like this is adding a deeper level of knowledge about how systems are operating, the kinds of questions that people should be asking into the future,” she said.